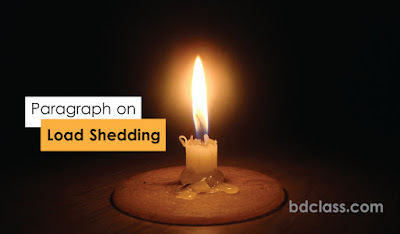 In this post, I am going to share a paragraph on load shedding for almost all classes. You know this paragraph is very common for high school and college level students. Ok, now see the following paragraphs on load shedding. Load shedding is the most talked problem in our country. It is a common affair today. It has become a serious problem in our daily life and it is a national crisis. It has created a deplorable condition in our daily life. There are many causes of load shedding. Misuse, illegal connection, insufficient production are the main causes of load shedding. Some dishonest persons are also responsible for it. Load shedding has far-reaching consequences in the socio-economic development of the country. The problem is getting worse day by day. All classes of people are the victim of it. Due to load shedding, the entire lifestyle both domestic and industrial comes to a standstill. The running mills, factories, and industries come to a standstill hampering normal productivity. Even operations stop in hospitals. The students cannot continue their studies. The food kept in the refrigerators gets rotten due to load shedding. To solve the problem our government should establish more plans and powerhouses. All of us should be sincere to remove this problem. Public awareness is also needed in this respect. Load shedding means the suspension of the supply of electricity. It is a common affair in our country. It has become a major problem. It is a burning question in our society. We cannot lead a normal life for this problem. The problem is getting worse day by day. There are many causes of load shedding. Misuse, illegal connection, insufficient productions are the main causes of load shedding. Some dishonest persons are also responsible for it. All classes of people are the victim of it. Due to load shedding production in mills and factories decreases. Operation stops in hospitals. Students also cannot study properly. After all, load shedding effects on the economy of our country. Our Govt. has already taken the necessary steps to solve this problem. All of us should be sincere to remove the problem. Public awareness is also needed in this respect.